Prevents fish-eyes by removing water, oil & contamination without the use of desiccant. Designed for use in prep stations and air/finishing areas. 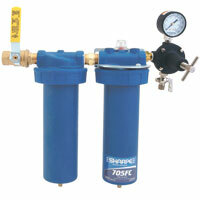 Stage 1 provides removal of water and contaminants down to 5 microns. Stage 2 provides removal of oil and sub-micronic particles down to .01 microns.